Vibrazum was designed to create movement to the sound making a complex waveform with few elements, or going deeper to build a crazy patch with the separated channels. Vibrazum is very versatile with lots of voltage control inputs. 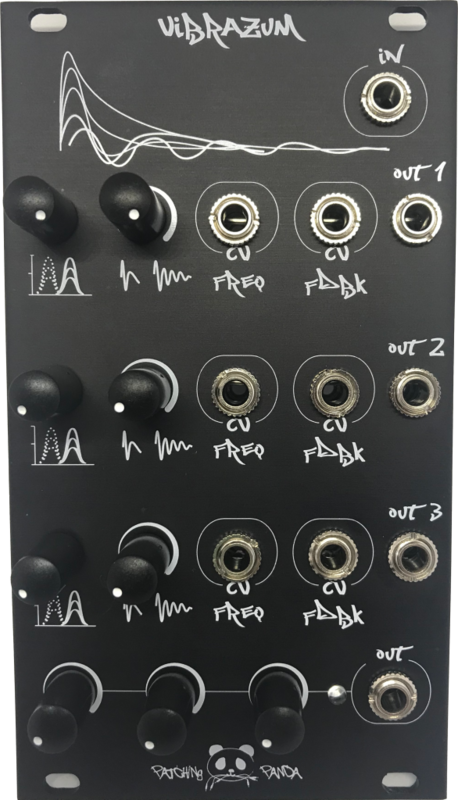 Feed 1 audio input into three separate voltage controlled band pass filters with voltage control resonance. Each channel is able to sweep in all the frequency spectrum. The feedback is capable to resonate in the low frequencies. You can route every BP separately and also have a dedicated mix output with attenuation controls. The filters are 2 pole 12dB/oct .